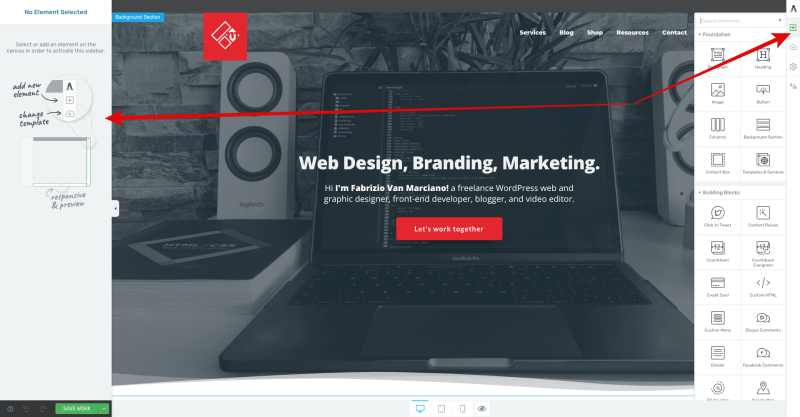 Thrive Architect Review (October 2018): Time To Fire Your Web Designer! 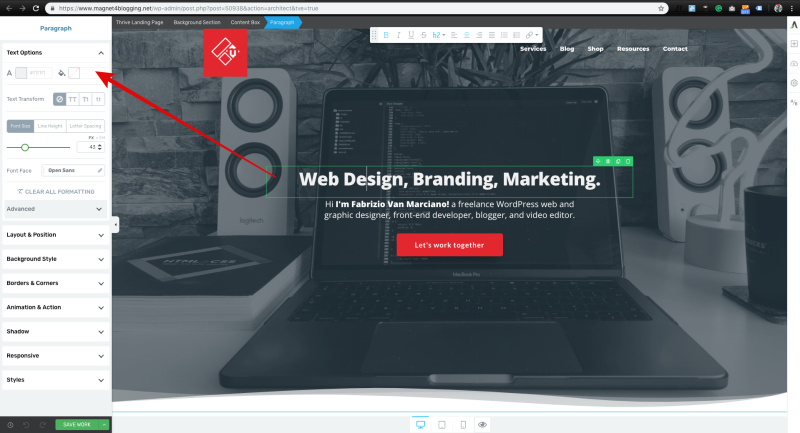 Creating WordPress content is a heck of a lot more fun with Thrive Architect. What’s more, you don’t need to be a web designer or developer to use it. What is this amazing tool and what can you do with it? Well, the question really is, what can’t you do with it? Let’s dive in. 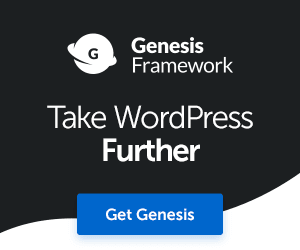 Way back in 2015, I purchased a WordPress plugin that was still quite under the radar. That plugin today has transformed to be one of the best tools I’ve ever invested in my business. Thrive Content Builder, what it was called at the time, is now Thrive Architect. Above: The old Thrive Content Builder Plugin was an amazing page builder tool when I discovered it in 2015! Like I said, I started using Thrive Content Builder when it was in its infancy, which over the years have gotten better and then eventually transitioned into what is now Thrive Architect. This plugin has made so many things possible for me. For personal use, it has transformed my online business. It truly has been a huge part of my online success. As a freelance web designer, Thrive Architect has been the tool I use the most on client projects. So – the burning question is this – is Thrive Architect really that good? The short answer is… heck yes! But let’s dive even deeper. Thrive Architect is a powerful, stand-alone front-end, drag-and-drop page builder plugin for WordPress. So what this means is that you can build any type of page in WordPress using simple drag-and-drop. All of the design elements, options, and features that you can think of using in your content or page is right here in this plugin. We’ll look at the various types of pages you can create with TA later on in this review. Thrive Architect was created by Thrive Themes. A digital products and services company that also provides a wide range of high-quality, conversion optimization tools for WordPress. How are YOU going to benefit from using Thrive Architect? You’re no longer going to have to rely on your web designer to get your pages looking the way you want them to look. By not using a web designer or developer, you’re going to save time and money. You can create any, absolutely any, type of page you want for your business. 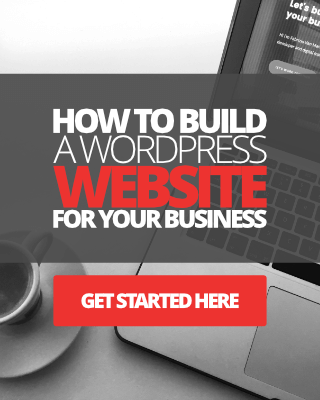 Almost everything you dreamed of ever doing with your WordPress site, from creating a custom homepage, product pages, sales pages, lead generation pages, podcast pages, video archive pages, blog posts, and everything else in between, is possible with Thrive Architect. OK, so how do I personally use Thrive Architect in my business? I want to quickly explain how using Thrive Architect is helping me right now in my business. So, you know I use it for client projects, but what about my own website? Well, take a look at my homepage. This was designed using Thrive Architect. I’m also using it right now, as of updating this review in October 2018, to build my course content pages, which I’ll be launching soon. In the video tutorial below, I show you how to create a custom homepage design from complete scratching using Thrive Architect. Take a look. The UI in Thrive Architect is one of the best in any plugin. It has a clean and simple layout. Navigating around the various elements and options is a real pleasure too. Yes, there are quite a few elements to choose from, and if you can’t find what you’re looking for, you can use the nifty Search Elements box at the top. When you launch Thrive Architect from any page or post, a new tab opens with the editor. See images below. Thrive Architect is a breeze to work with on larger screen sizes. I use a 27″ monitor so I have plenty of screen space to play with, however, if you’re on smaller screen sizes, I’d recommend minimizing the main sidebar to give you more screen space. To start editing a page, all you do is find and add an element from the right sidebar, and drop it into the canvas. 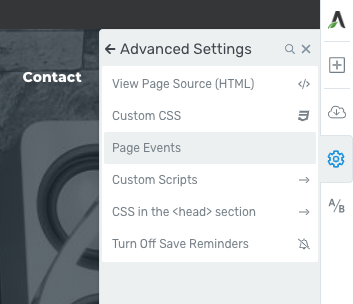 You’ll notice the left sidebar options will open up in order for you to edit that element. See images above. The UI also has a useful navigational breadcrumb feature at the top of the page to let you know what element you’re working and also where. This is so useful when you’re working with multiple elements inside of content boxes inside of multiple columns within a background. See image below. 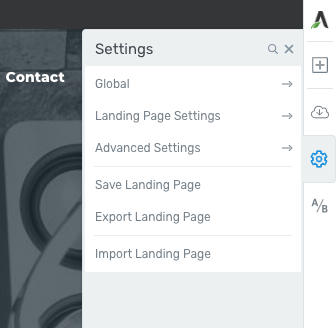 Before you build any kind of page with Thrive Architect, you have the option to make some changes to the default settings according to your preferences. Before we look at the elements and design options, with Thrive Architect you get access to the landing page template library. All you have to do is pick one, customize it, and you’re ready to rock and roll. To add a pre-designed template to your page, you simply click on the small cloud icon in the right sidebar menu, you’ll see a pop-up with a bunch of templates for you to choose from. These templates are stored in the Thrive Template Cloud. So let’s now look at the full list of design options and features in the Thrive Architect plugin. I won’t dive too deep into each of these elements, I’ll leave you to discover them for yourself. Once again, with almost all of the elements in Thrive Architect, you have options to customize them even further, giving you complete creative freedom and control over the entire design of your pages and content. 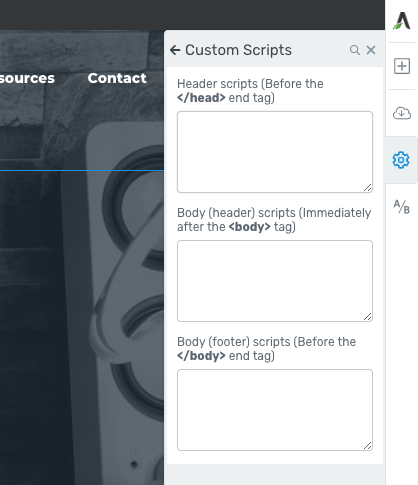 As a web designer and developer using WordPress, I love having the best of both worlds – In this case, using visual front-end design tools and custom code implementation. Using the HTML and CSS features is really easy and fun as they support Syntax. See image below. 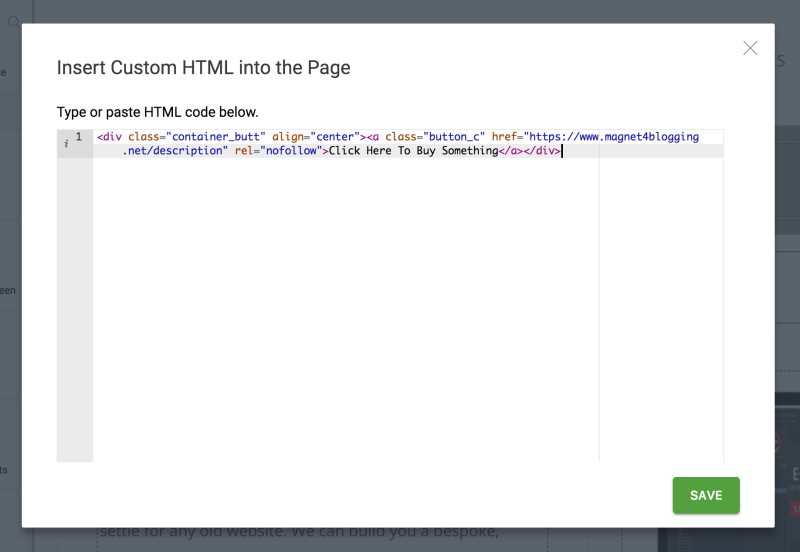 Custom HTML added to the Custom HTML building blocks element. Another powerful feature in Thrive Architect is the mobile responsive design modes. This is located at the bottom of the screen along with the review option. See image below. Whilst still on the subject of responsive design, many of the design elements come with a Responsive option. 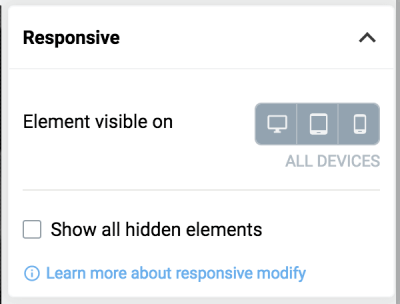 In other words, you can switch certain elements off so that they don’t appear on mobile devices, move elements around, and literally create a completely separate design for mobile devices. See image below. What can Thrive Architect be used for other than creating landing pages? Here is a list of the types of landing pages you can create with Thrive Architect. 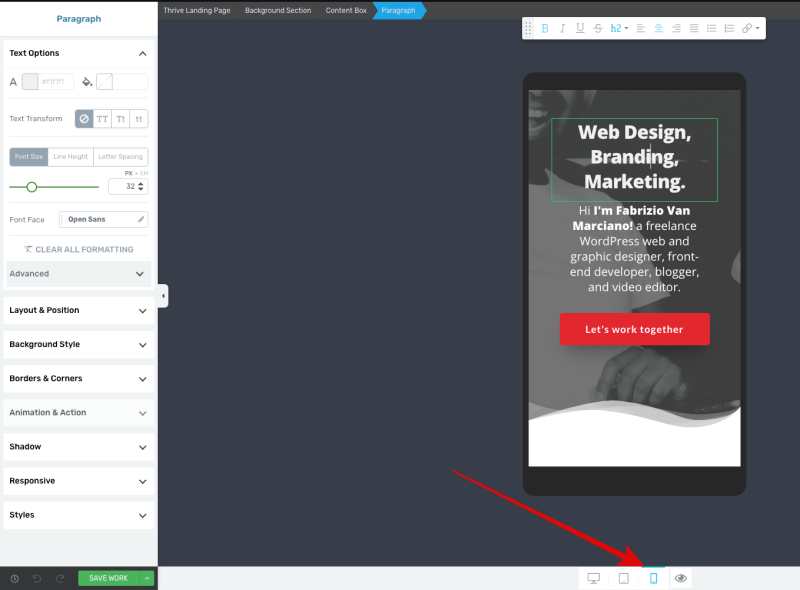 Webinar landing pages and more. What makes this plugin complete is the awesome add-on plugin that is available from Thrive called Optimize. 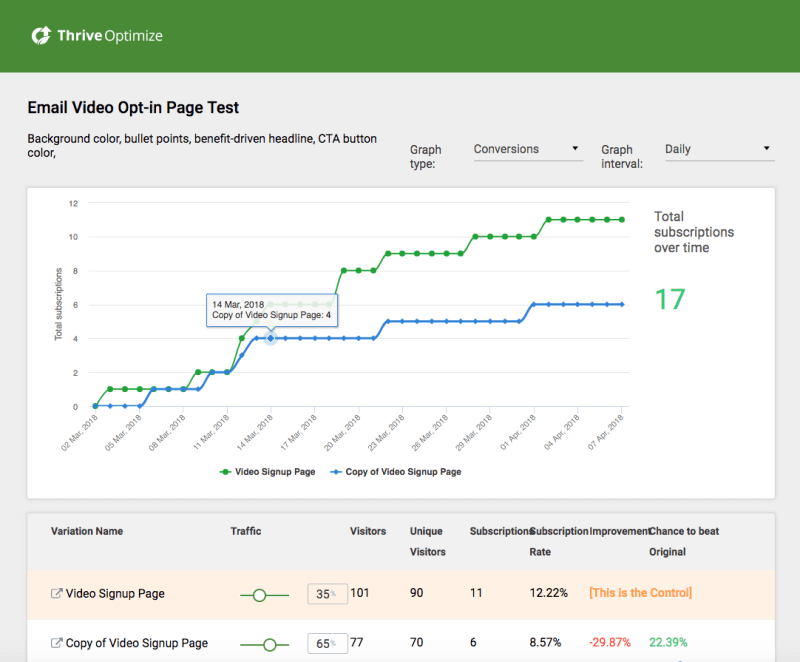 With the Thrive Optimize plugin you can perform simple but effective A/B split testing campaigns for every landing page you create using Thrive Architect. Check out my review of Thrive Optimize Add-on plugin. How do you use Thrive Architect? OK, time to have some fun. To create a new page or post, you simply go to page/post > add new > add a title and save draft > click on the green Edit with Thrive Architect button. A new tab will open up and you’ll see the front end of your page or blog post – you’re now ready to start adding elements and creating your content. See image below. Adjusting the layout and position of your elements is easy too. 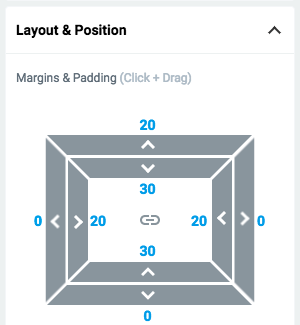 With each element, you can open up the Layout & Position tab adjust both margins and paddings. See image below. If you want to get a better idea of how to use some of the elements in Thrive Architect, check out the video below where I use this plugin to create a custom blog style homepage in WordPress. Thrive Membership for individuals and entrepreneurs – $30 per month (Paid quarterly) or, $19 per month (Paid annually). Thrive Membership for agencies and web designers – $69 per month (Paid quarterly) or, $49 per month (Paid annually). Now, let me finish this review with sharing what I love and what I hate about Thrive Architect. As I said at the start, I started with the original Thrive Content Builder plugin back in 2015. Of course, Thrive Architect is a huge leap forward from those days. And sure, there are a few small niggles here and there that still need ironing out, not from a technology standpoint, but more from a usability. Something I should have mentioned earlier in this review is the Thrive team’s ability to provide exceptional support, updates, and fixes for its software when it’s really needed. You can’t fault this company at all in this area, and that’s another HUGE reason why I love using Thrive products in my business. 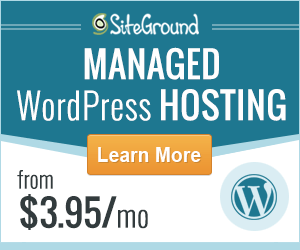 They understand their customers more than any other WordPress software company I’ve used in the past. Fully loaded with tons of design elements. 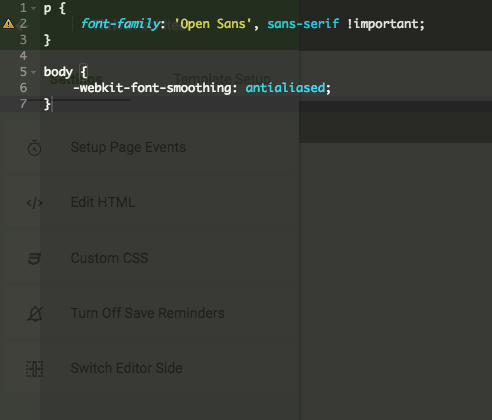 Built-in HTML and CSS syntax editor for adding your own custom code. Access to over 120 pre-designed landing page templates. Unlimited plugin updates and they’re quite frequent too. 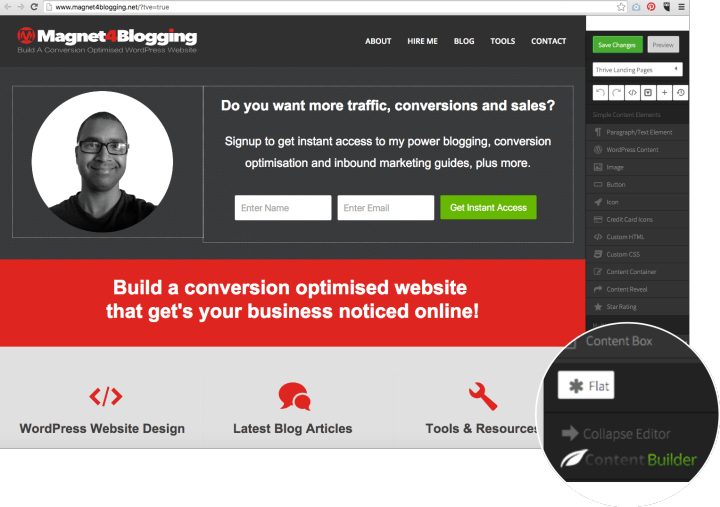 Thrive Optimize Add-on plugin available to help you do A/B split testing for your landing pages. A resource packed knowledge base with tutorials and an active forum for members. A rock-solid team behind the Thrive Themes company. A massive time and money saver – Fire your web designer! Does not work with free WordPress.com websites. Maybe it’s time to move to a hosted WordPress site. And my verdict on Thrive Architect? I was excited when I first discovered Thrive Content Builder in 2015, and I’me even more excited now as the plugin has just received a massive update (October 2018). This is by far the most advanced front-end visual editor plugin for WordPress, period. A lot of folks might disagree, and there are plenty of other alternatives out there to choose from for sure, but speaking from personal experience, none of them offer the complete flexibility and the level of customization and ease-of-use as Thrive Architect. I love to mess about with code and get all techy when I’m working with WordPress websites, but using Thrive Architect is so much more fun. Final words on Thrive Architect, it’s great in every way. 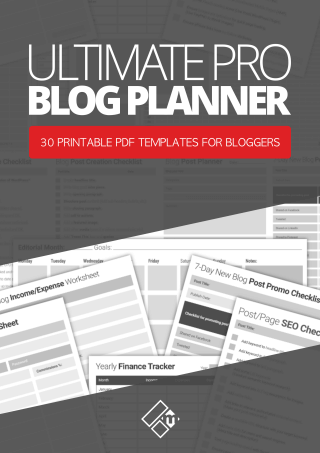 It’s a tool every smart business owner, blogger or entrepreneur should have in their toolbox. If you’ve just purchased Thrive Architect for yourself and are in need of some tutorials, check out my YouTube channel as I frequently add new Thrive tutorial videos there. Affiliate disclaimer: Please note that this post contains affiliate links to the Thrive Architect plugin. Should you use one of my affiliate links to purchase this product I will be paid a small commission at NO additional cost to you. I appreciate your support always, and I want you to know that I never use, review, or recommend tools or services that I do NOT trust. Read my full disclaimer here. Indeed Thrive architect comes with the power pack features all along, with a quality one like page builder for wordpress. They too offer Vertical split and one can edit previous articles too. Inspite of that they are pricing quite a bit, for some new bies. Thrive Architect is right now not usable due to the mass of technical problems. A lot of common functions from the predecessor doesn´t work or exist at all, e.g. 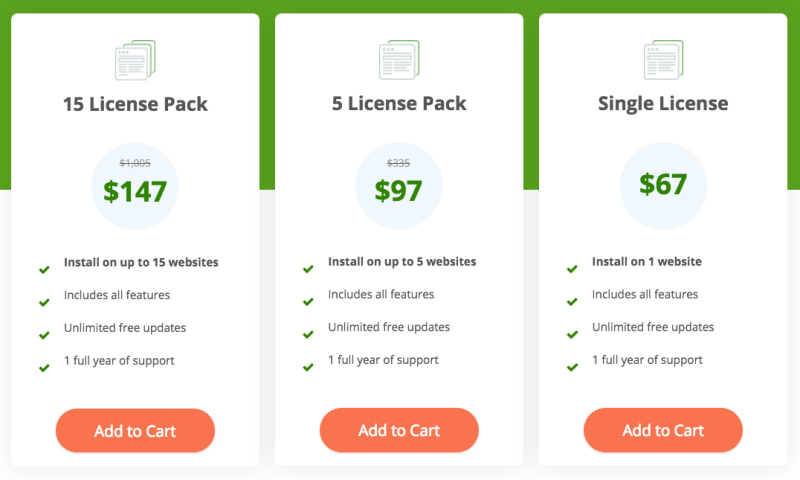 pricing element, content boxes with/without header/icon a.s.o. After a couple of hours of testing, I went back to Thrive Content Builder. Glad to had a backup (which I recommend before upgrading). Thank you for your comment and feedback. I am testing Thrive Architect every day since I upgraded it on my site, and I too have found a very small handful of issues with certain elements and features. Some of those elements and features, as you rightly said, either don’t work, load, or as I’ve found freezes my site/page altogether. I am updating this review as and when I find issues worth mentioning to my readers and customers here. I have been a Thrive customer for a long time now and I’ve used all of their products of which I’ve never had a major problem with in the past. However, from time to time there are bound to be a few issues and I know that the team always work hard to fix and resolve those issues promptly, ahead of the official release of the plugin. Just picking up on one point about the missing ‘Content Container’ element from TCB as I liked and used that too. From my first dabble with Thrive Architect (and watching the Quick Start Tutorial), I think you’ll find that the ‘Content Box’ element is the replacement for our beloved ‘Container’. You can do a lot more things with the ‘Content Box’, and I guess it doubles up as the ‘Container + Box’ elements from TCB. I’ve not upgraded my previous TCB content yet. Just testing a new install of Thrive Architect. Yo David, mate thanks for the update on that one. When I tried dragging the content box to my page earlier it wasn’t working whilst testing each element, so I’ll give it another swirl later on. Hey thanks for the honest review and mentioning about the bugs. Wanted to make sure I can update all my client’s sites to use the new update. As the same thing happened when they rolled out v1.5 update and so many bugs interrupted productivity. I see you have striked-off the last paragraph on bugs, does that mean its safe to update now? Thanks for your comment, I appreciate it. I’m glad you enjoyed the review. I’ve striked off the last paragraph because those issues appear to be fixed, at least for me anyway, they don’t seem to be there anymore when I’m using it myself. I left the paragraph for people to read just in case those bugs might still be an issue for them.